It’s rare for me to watch a film and feel that the soundtrack was something that really demanded attention. That’s not to diminish the role of sound in films, it’s just a way of showing how my mind works. I watched the brilliant horror film It Follows a few days ago (you can read my review on Amongst Geeks here) and was immediately struck by the soundtrack. It was sinister, novel and dark as hell. The musician behind the It Follows soundtrack is Rich Vreeland aka Disasterpeace, a knowledgeable and prolific videogame music creator in the chiptune / 8-bit genres. I have to hold up my hands and admit that this isn’t a genre of music that I usually listen to, although I can appreciate the work that goes into it. Sounds are designed to sound like (or actually are) played through the retro sound chips of older computers and game consoles, giving them those nostalgia inducing Mario or Metroid type pangs that take you back to your childhood. Judging by his Bandcamp releases at least, It Follows looks like it might be his darkest work of recent times, which is what piqued my interest. While the album isn’t classified as dark ambient, I think it certainly could be. What you’ll get if you listen to the soundtrack is the mental equivalent of being buffeted at sea. A good number of the tracks alternate quieter booming rumblings and harsh high pitched screeching tones, lulling you and then jarring you moments later. My hands down favourite track has to be Title, partly because the main rhythmic tone arrangement puts me in mind of the famous shower scene music from Psycho. It also has a hook-laden chorus that rattled around my head for at least 24 hours after hearing it. As with all great albums, there are the lighter, smoother tracks along with the harsh. Jay is one such track, an almost sunlight infused track that is slower and, if not outright tranquil, the sinister undertones are less than other tracks. Detroit is another example of a quieter track, but even though it is less frantic, it still conveys feelings of fear and sadness. One grandstanding track that features a little of everything is Company. The tone at the start of this track sounds a little like bagpipes being softly abused. It goes quiet and hollow echoing thuds emerge, a high-pitched whining noise grating over the top of them. A deep rumble joins when the whining ends and everything holds its breath. A warped tone sounds over everything again, like a kettle boiling but off kilter and harsh. The deeper distortion behind it sounds a little like horses galloping. The track fades to a kind of ‘electro agitation’ that seems to charge the air, before a quieter tone suggests itself in the silence as it leaves. All goes quiet once more before the quieter tone looms again with a more gentle bass sound. The track ends violently with very harsh sounds distorting and shrieking for the last few seconds. Quite an experience. Being a soundtrack album, many of the tracks are no more than a couple of minutes long, some less than one minute. This makes sure that no one track or soundscape outstays its welcome and as a listener, this keeps you more alert and interested, even as some of the melody based segments follow the same general scheme. Even though it appears I’m a pretty easy to please reviewer, partly due to only reviewing stuff that interests me anyway, giving out full marks has only happened a few times over the last few years. The It Follows soundtrack can join the handful of albums that have wormed their way into my mind as I’m giving it 5/5. From a personal perspective, it’s something a little different to what I usually listen to but that still manages to take me to that dark place that I like my more ambient music to take me. The chiptune / 8-bit underpinnings appeal very much to my geeky videogame playing side whilst the drones and bass appeal to my dark world creating fiction side. A complete performance I guess you could say. 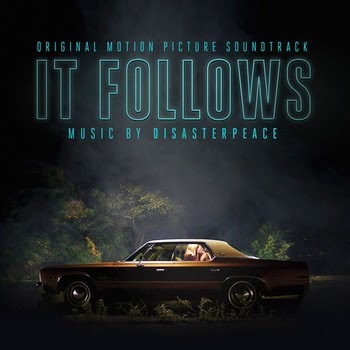 If any of what I’ve said has intrigued you, you can check out Disasterpeace’s website here and pick the It Follows soundtrack up for not much money at all. I also urge you to go and see It Follows while its at the cinema, or buy it when it is released for home viewing. I was given a free copy of the album for review. Great soundtrack. It was the first thing that hooked me when I saw this movie. To me, it dark synth sounds were the thing that appealed to me. I felt as though i was listening to a John Carpenter score. The film and the music complement each other brilliantly! Yes definitely. It is nice that a more unusual film like It Follows had a distinctive soundtrack to go with it. It could have easily gone the rock/metal soundtrack path.